Selling appreciated stock now causes a larger tax bite for many high-income earners. Now that the Bush tax cuts have expired and Obamacare will add additional tax burdens, many people need to think twice before realizing a large gain on their investments. In the words of a famous country musician, Kenny Rogers: You got to know when to hold ’em, know when to fold ’em. 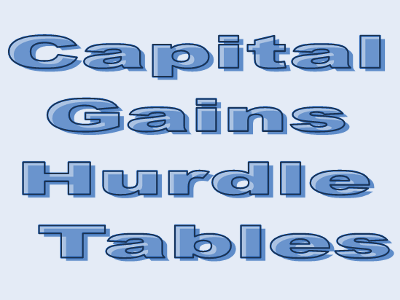 If you are planning to sell an appreciated stock and reinvest the proceeds, it’s a good idea to consider what are called hurdle rates. That means: the added growth necessary to overcome the tax bite when you realize gains on your initial investment. This first set of tables here applies to the beneficiaries of your estate who expect a step-up in basis. The assumption is that you plan to hold either your current stock or the stock you buy to replace it after a sale – right into the grave. If you did, Uncle Sam gives your heirs a reprieve from having to pay capital gains taxes by offering a step-up in basis. Say you buy a stock for $10 per share (known as the “basis” for tax purposes) and 10 years later it is worth $50. Should you sell at that point, you must pay capital gains tax on the $40 appreciation. But if you keep the stock and die and your heirs inherits it, his new basis if he sells is the current price, $50. Example: Clark, age 75, owns 5,000 shares of Black Gold Oil Company that have doubled in value and are now worth $100,000. When Clark dies, his heirs receive a step-up in basis and do not owe any capital gains tax. However, Clark is concerned about the future prospects of the Black Gold Oil Company and is considering selling the stock and investing the money elsewhere. If he does sell his $100,000 stock with a $50,000 basis, he must pay $11,900 in capital gains tax because his income is subject to the highest rates (23.8%). If Clark dies in 10 years, and the original investment grows at 8%, this new $88,100 investment would need to grow at least 9.38%, which is 1.38% in addition to the original growth rate. If Clark only lives five more years, this new investment must grow at least 10.77% a year (8.00% + 2.77%). Because Clark’s family history suggests his life expectancy is closer to age 85 than to 105, he decides against selling the entire position because the hurdle rate is quite high. If this stock makes up more than 15% of Clark’s total portfolio, he should reduce the position immediately. Diversifying a concentrated stock position is always the right answer despite the tax consequences because no investors should risk their fortunes on any one company. 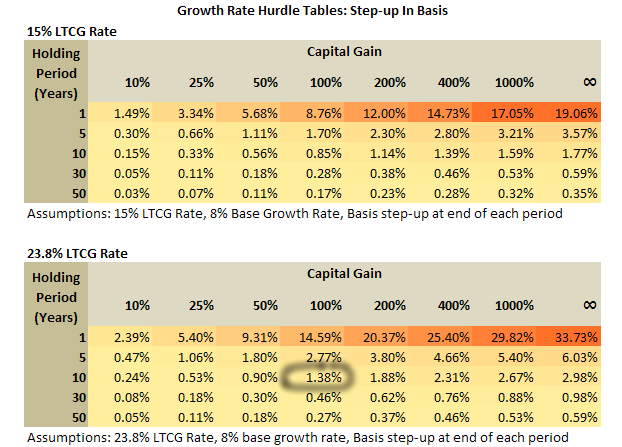 Yet a 1.38% expected hurdle rate gives many investors pause before unloading a stock that is highly appreciated. The hurdle rates are lower for those who qualify for the 15% rates but remain a factor that you should not ignore. Unless your assumptions lead to a hurdle rate that is under 0.5%, replacing this investment and paying the tax bite is probably a mistake. The second set of tables applies to those who are more likely to sell a stock before they die. These investors will not get a step-up in basis. Example: Jack, age 50, owns $75,000 of a mutual fund that focuses on small company stocks. Called the Discovery Fund, it is up 1,000% since his purchase. Jack is considering selling his position because the management of the fund has changed and the fees are high. If Jack sells, he’ll owe a 15% capital gains tax on the gain, or $10,227.27. If Jack holds a replacement investment for five years, this new fund needs to grow at 1.07% in addition to the growth he expects from the Discovery Fund. 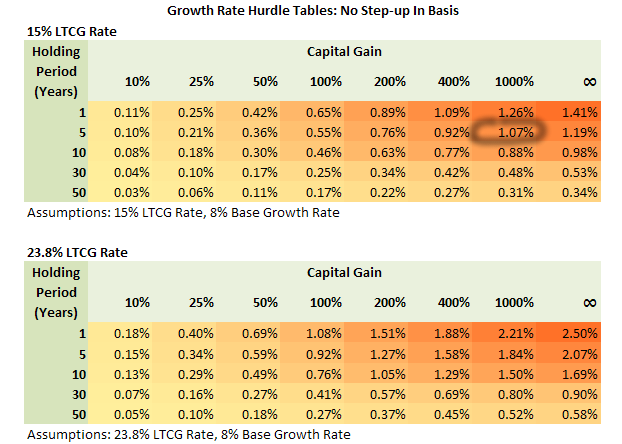 One implication of these important hurdle growth rates is that investors may reconsider selling higher cost mutual funds that are highly appreciated. In some cases, you can reduce your management fees by as much as 1% by using lower cost replacements. However, if the savings are only 0.5%, the advantages to switching are only available to those who expect to have a very long holding period. As tax rates rise, so do the costs of switching investment strategies. Viewed from this perspective, higher tax rates create a less efficient economy because investors are penalized for dumping their dogs. Before selling a highly appreciated position, the hurdle tables ask you, “How confident are you that this new stock position will outpace your original investment?” If you hire an investment manager, be sure to ask him or her the very same question. You may decide it’s better to hang on to an appreciated stock, or perhaps even better, donate it to a charity. Tax consequences are not the driver but one very important passenger on the express bus to financial freedom.